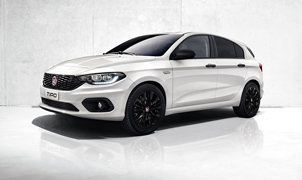 Fiat has announced a special edition of the Panda crossover in partnership with the smartphone navigation app Waze. Waze allows drivers to avoid traffic or road closures by using live data and suggesting alternative routes to drivers. More than 100 million people use the smartphone app. In the Panda Waze, the navigation app has been integrated into the car’s Uconnect infotainment system, which can also be control via your smartphone. Waze can be displayed on the car’s main display screen with route instructions and estimated time left to destination. If fuel is running out or low tyre pressure is detected, an alert will appear on the smartphone display and the user can decide to select one of the best-priced filling stations or choose from the nearest workshops offered by the Waze app. The model is based on the Panda Cross so features more rugged styling and faux-SUV look. Waze stickers have been added to the front bumper, while black detailing has been added to the roof bars, door mirrors and handles. It’s powered by Fiat’s 69bhp 1.2-litre petrol engine.